In the 2000 population Census in the province, Bohol’s population reached the million people (ranked 17th highest among 78 provinces) RAPIDLY INCREASING AT 2.92% PER ANNUM (1995-2000). 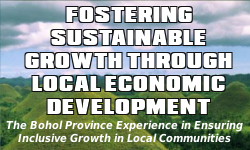 Given this growth rate, the population of Bohol is expected to double in 24 years. Bohol ranked second in Central Visayas (Region 7) in terms of population size constituting one-fifth or 20 percent of the 5.7 million populationb of the region. Nationwide, the province contributed 1.5% to the country’s population of 76.5 million in 2000. The average household size recorded in Bohol was 5.3 persons in that same census, higher than the figure five years ago at 5.18 persons and the national average of 5.0 persons. Almost half of the female population in Bohol belonged to the childbearing age group (ages 15-49), 10 percent of whom are in the 15-19 age bracket. The population in the productive ages (15 to 64 years) represented 58 percent of the total population while the proportion of those aged 65 years and over was about 6 percent. The CY 2000 dependancy ratio was computed at 72, down from 80 in 1995. The males slightly outnumber the females in that year (101.6 fro every 100 females). Females dominated higher levels of education accounting for 52% of population (NSO 2000). Children and the youth comprise 36% of Bohol’s total population.